Accurate torque measurement to 4, 5, 6 Nm NOTE: Requires separate 6mm allen key to turn dial. 6mm allen key not included with set, 6mm sold separately. ACCURATE TORQUE MEASUREMENT to 4, 5, 6 Nm; three torque levels to cover most recommended manufacturer tightness settings in one tool. Includes four interchangeable tool bits: 3, 4, 5mm hex / allen and T25 to cover most bike needs - including adjusting stem clamps, seatposts, headsets, handlebars and lever clamps. NOTE: Requires separate 6mm allen key to turn dial. 6mm allen key not included with set, 6mm sold separately. PEACE OF MIND - Have you ever worried about over-tightening a bolt and damaging your bike? Remove guesswork and risk with our torque wrench, which prevents over-tightening bolts and damaging your carbon fiber or lightweight components. 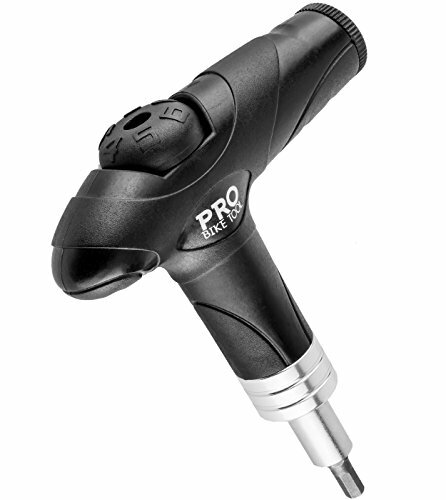 Includes 'cam-over' feature, ensuring the torque wrench will continue to 'click-out' once torque is reached. It ensures a bolt cannot accidently be over torqued. Each tool is fully tested. BUILT TO LAST & COMFORTABLE TO USE - Internal construction made from carbon steel. Ergonomic composite mold handle for comfortable use and to help apply the correct force. LIGHTWEIGHT AND PORTABLE - Small and lightweight, making it a perfect tool for your bike box so that you can rebuild your bike on vacation or a weekend away with no stress.